Robert Greene’s groundbreaking guides, The 48 Laws of Power, The Art of Seduction, and Mastery, espouse profound, timeless lessons from the events of history to help readers vanquish an enemy, ensnare an unsuspecting victim, or become the greatest in your field. In The 33 Strategies of War, Greene has crafted an important addition to this ruthless and unique series. 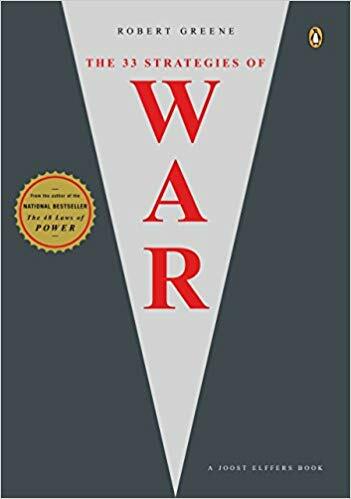 Spanning world civilizations, synthesizing dozens of political, philosophical, and religious texts and thousands of years of violent conflict, The 33 Strategies of War is the I-Ching of conflict, the contemporary companion to Sun Tzu’s The Art of War. I always enjoy weird history and nonfiction books, and I think The 33 Strategies of War classifies as one of them. A friend from work let me borrow her son’s copy of this book, and I read it in three days. I could not put it down because it was so fascinating to me. Of course, this would be an easy book to pick up and put down after reading a chapter since each chapter is a different war strategy. I think that this is a great book for anyone who loves history because there are so many historical references within it that taught me about a lot of different people in history. I also thought it was great that there was a reference to people that I had read about in the Desert Queen. This book also teaches about leadership and how people’s minds work, which I love to read about. I think that this is a great book that everyone should try to pick up because it teaches so much.